I just fished editing my DIY Amla Infused Grapeseed oil and wanted to explain why I personally like using it. I have already mentioned how and why I like using Amla powder as part of my Henna/Amla Treatment and have a video of my process but also wanted to touch upon the benefits of the oil. 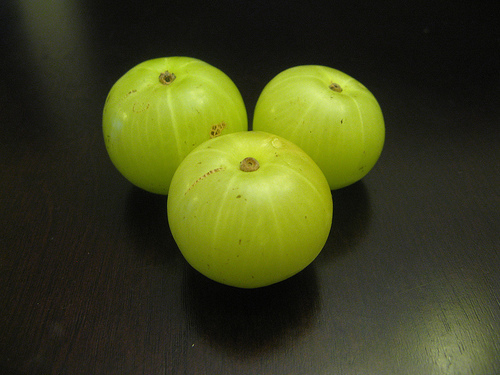 Amal (Gooseberry) is a green fruit renowned in Asia – mainly in India. It is rich in Vitamin-C and minerals and is considered a powerful antioxidant agent that has several uses (not just for the hair and skin.) The fruit itself tastes extremely taut and bitter but can be made into a juice or eaten as a fruit. Due to is high Vitamin-C content, it is known to be used against coughs and colds, can help boost the body’s immune system and is refereed to as a detoxifier that can help cleanse the liver and kidney. Amla juice has been said to be effective in lowering the fat content in the body which can help in weight loss and is even said to be beneficial for your eyes due to the presence of antioxidants. Now looking at it as an oil: it can be used for both your hair and skin – I love multipurpose products! Amla infused oil can be used to trap in moisture (after you have showered), provide a glow to your skin and delay the appearance of fine lines and wrinkles (with frequent use). Its antiseptic properties makes it a good skin cleanser and is known to help reduce blemishes & dark circles under the eyes. Amla infused oil can help darken the hair (with frequent use*), promote growth, strengthen the hair from roots to ends, enhance luster and shine, reduce shedding, thicken the hair and help promote its overall condition. *If you have light or bleached hair and do not want it darkened then this oil might not be for you. The oil will not make make grey/white hair black but it can gradually darken its appearance. It is known to help combat mild scalp irritations and dandruff due to its anti-inflammatory, antibacterial, antiviral, anti-fungal, and antioxidant properties (check with your doctor/dermatologist). Depending on your preference you can use any carrier oil of choice. The additional benefits you will get from the oil will all depend on what you choose to use. I usually use Grapeseed oil due to the fact that it is light and easily absorbed. Click on the link for a list of different carrier oils and their benefits for the hair and skin. I will have a new post with my video and an explanation of how I make the oil shortly! This entry was posted in Amla for Hair, Amla for Skin, Amla infused Grapeseed Oil, Ayurvedic Herbs for Hair, Ayurvedic Hers for Skin Care, DIY Infused Oil for hair, DIY Infused Oil for Skin, Infused Amla oil for hair, Infused Amla oil for skin and tagged Amla infused grapeseed oil, Amla infused grapeseed oil for hair, Amla infused grapeseed oil for skin, DIY Amla infused oil, DIY Amla infused oil for hair, DIY Amla infused oil for skin, DIY Infused oil on October 26, 2014 by Maicurls. If you are wondering why would you want to make an infused oil? I say why not?! In all seriousness, infused oils give you the option of incorporating your favorite ingredients to your favorite carrier oil – adding more punch, nourishment and benefits for your hair and/or skin. Infused oils can be used in a number of different ways such as: Pre-poo’s, hot oil treatments, scalp massages, Deep Conditioners, leave-in conditioners, whipped butters, sealing…ANYTHING! Their benefits depend on the ingredients used for infusion and the carrier oil you use. With each of my infusions I will list the benefits of each and how I personally use them. You can incorporate infused oils into a DIY Body butters, sugar scrubs or even directly onto your skin to trap in moisture after a shower. Heads up – Rose Infused Grapeseed Oil will be first! I hope you enjoy this “mini series”. Do you make your own infused oil? If so what do you make and how? I would love to hear from you! 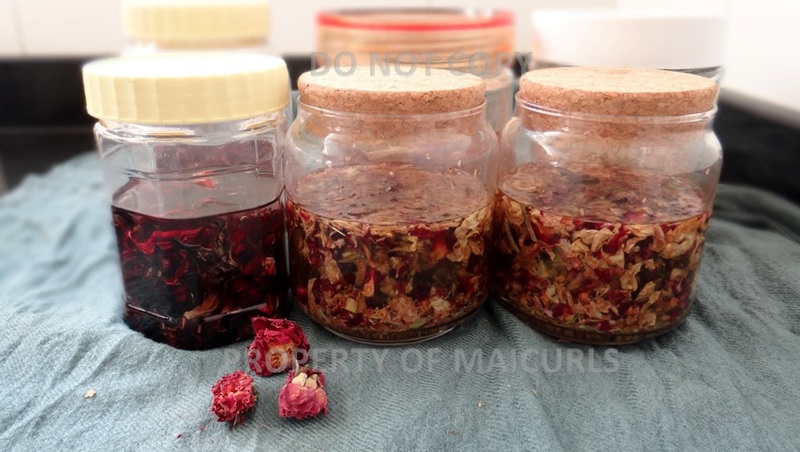 This entry was posted in Almond Oil for skin, Amla for Hair, Amla for Skin, Ayurvedic Herbs for Hair, Ayurvedic Hers for Skin Care, Coconut Oil for hair, Coconut Oil for skin, DIY Infused Oil for hair, DIY Infused Oil for Skin, DIY Infused Oils, Grapeseed oil for Hair, Grapeseed oil for skin, Infused Amla oil for hair, Infused Amla oil for skin, Infused Coffee oil for hair, Infused Coffee oil for skin, Infused Hibiscus oil for hair, Infused Neem oil for hair, Infused Neem oil for skin, Infused Rose oil for hair, Infused Rose oil for skin, Natural Ingredients for curly hair, Natural ingredients for skin, Natural Moisturizer, Natural oils for natural hair, Skin Care, Uncategorized and tagged Almond Oil, Ayurvedic herbs for hair, Ayurvedic oils for skin, Coconut Oil, DIY Amla Oil, DIY Coffee Oil, DIY Hibiscus Infused Oil, DIY Infused oil for hair, DIY Infused Oil for Skin, DIY Neem Oil, DIY Rose Infused Oil, Grapeseed Oil on September 11, 2014 by Maicurls.